Steven (Chicagoland, United States) on 13 December 2010 in Landscape & Rural and Portfolio. 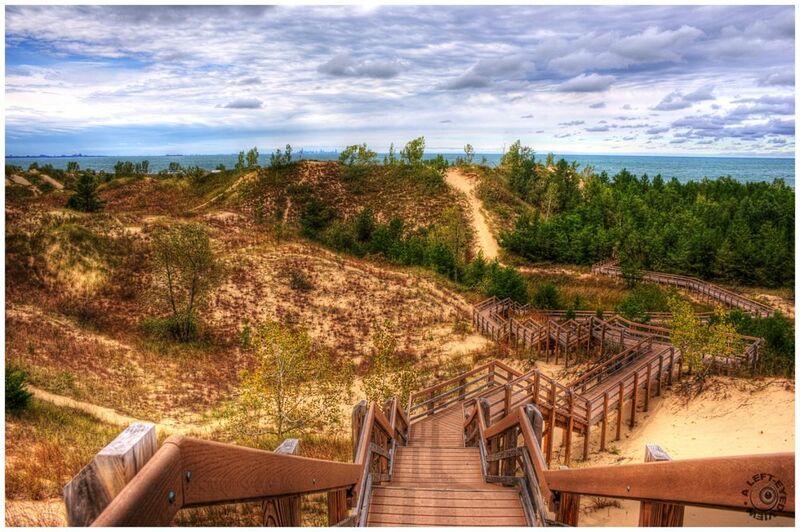 View of the Chicago skyline was captured (just left of center) across Lake Michigan as seen from the top of the stairs of a trail at the Indiana Dunes State Park. Photo captured September 25, 2010. Yes it is!!!!! Beautiful color and processing! Wonderful composition!!!! 5*****! That's so cool - great shot! . . giving access to Heaven South and Heaven Central by the looks of this ! I'd love to have been there with you, but I don't think I'd manage those stairs! Great image, point of view and treatment, this makes for a five stars for sure. gorgeous scenery, very neatly processed. love the symmetry and the gorgeous colors! Whoa...now THAT is cool!! I love this, Steven!! I would love to visit this place...a beautiful, perfect composition! Great HDR subject, and a great state park. Love the view along the path. A cool set of stairs leading the eye. Nice! I've heard of the dunes but not seen a picture before... thanks.